But if we were, we could get married in NJ. Who knew?? 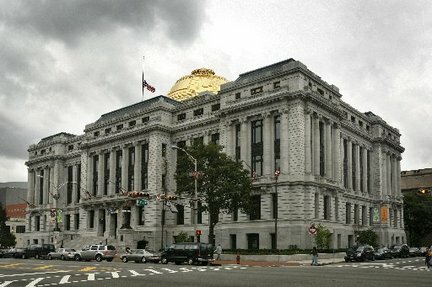 DB and I took a mini-break from atoning yesterday to head down to Newark City Hall to get our marriage license. We are New York residents but NY & NJ laws state that you must get the license in the municipality that you are getting married. So off the Newark we went. City Hall – It’s actually a really cool old building. Just like The Mezz! I then proceeded to invite him to the wedding via Twitter. I’ll let you know if he shows up! Don’t worry, my mom was an excellent witness. A few more signatures and questions and we were good to go. We have to pick it up the week of the wedding. Just in case anyone was wondering why David is the way he is—my great grandparents and his great great grandparents were first cousins. As David will tell u, it is always my fault! By the way David–u r wearing my great grandfather’s watch!